3 Weeks Later... 6 hours of string quartet recording: finished. 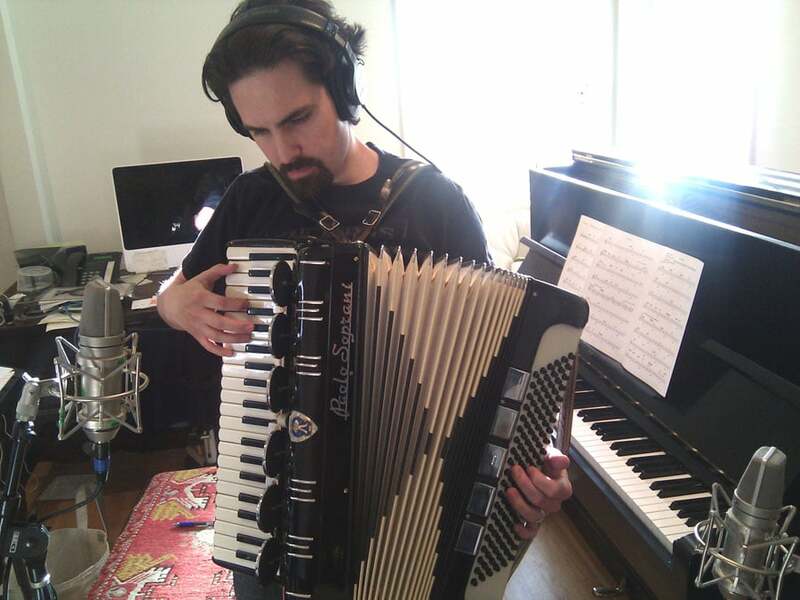 2 accordion tracks & 2 piano tracks: finito. 6 hours of guitar tracking: Bam. 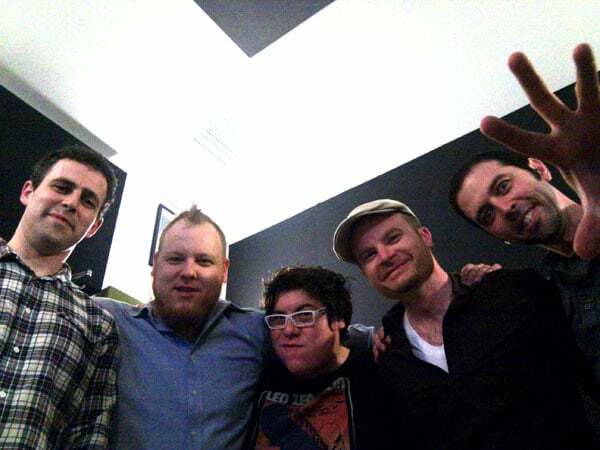 And 10 hours of vocal sessions: done. I’ve recorded my first 6-song Holiday mini-album! The album, December Songs, is to be released…uum...very soon! On iTunes. Like next week-ish..I will let you know precisely when I do. Here is the tale of how it came about…. So the day before the orchestral session for the Eureka Christmas episode, (where I’m featured as the ubiquitous voice of Christmas – airing Tues.Dec.7th on SyFy! ), I consumed an entire harvest of green tea in repentance for a sinful, sugary breakfast. Green tea is supposed to have anti-inflammatory properties, as well as digestive benefits, and I was hoping to clean out my system and start fresh on the rest of the day. Green tea also has a generous amount of caffeine, and this particular brand “Special Occasion Green Tea” is named that for a reason. I found out. It can turn any day into a truly special occasion. Back when I used to sing at a Thai restaurant called Banana Bay, out near Whittier, a Chinese man named Mike used to down this tea like water. He was a regular, and he would sit at the bar all night, and sink like 3-4 of these tea bags at a time. He would drink the tea out of a beer mug. He would drink it all night long, and somehow remain quite tranquil. I however, would need a day to recover from the 2 tea bags I had inhaled that Saturday. Dropping down the caffeine rabbit hole felt like this: First I was really, really, happy, then I started to get the distinct feeling I forgot to do something, then I was sure I forgot to do something, then I just felt late, late for everything, like I had to rush, so I started rushing through this chord chart I was writing, then when I was done I made Pesto sauce, then I practiced this really bangy piano tune of mine, then…I was hungry, really hungry, because I had forgotten to eat. All day. For 7 hours. So that was Saturday, and by the time I got to Capitol on Sunday I was still buzzy - but I didn’t want to want to come across freaky, so I got some herbal tea and chilled. I settled into my seat and Bear raised his arms on the stand. The strings swelled like a fruitcake in a dish of rum, and I heard my voice begin “Have Yourself A Merry Little Christmas.” I thought to myself, “Really, in recent memory it’s been jazz or pop, or various multi-ethnic stylings, but I haven’t stepped up to my 'classic crooner' chops in years." A few people in the room suggested that I should make a holiday album, and I basically gave a stock response like, “Oh yeah, that’d be cool, sure thanks.” – but through the rest of the session, as I listened through all my cues, I began to take the idea seriously. That night, after the session, Bear and I were off to a movie set for an all night shoot. We were going be featured extras in a horror film, but my mind was still digesting this “holiday-album-concept-thing.” The crew set up a shot involving people in cars, and Bear and I were at the end of the line. As I sat in Bear’s car - the temperature dropping to 50 degrees, marooned in a parking lot, surrounded by film equipment and people in layers of latex zombie decay - my thoughts began to combine into harmonies. In the mist of hordes dragging their hideous limbs and refuse, groaning in undead undulation, oozing in rigorous mortis - my mind was swaddled in snowflakes and sugar. But truly, the whole holiday season is an odd play, isn’t it? A dualistic study in darkness and light. There is something very mysterious about winter, and also very cruel about expecting so much “warmth and joy” out of the coldest time of the year. Many people are alone during the holidays, and shouldn’t they have songs too? Shouldn’t there be songs about more than the material icons of the season? What’s more important, stuffing yourself with carbohydrates with 30 people you barely know, or sharing something very small with 1 or 2 people you really love? These thoughts began to shoot around my synapses, and began to shape up a non-traditional holiday album. And that’s how the process began. I knew that the first thing I had to do to establish the tone was to write an original Christmas song. The next morning I woke up and wrote “Racecar 49,” my first holiday song, and the first of the two string quartet arrangements I would write in the next week…. …TO BE CONTINUED…. in the meantime, here are some pix! Left: Engineer, Laurence Schwartz sets up technology on a wicker thing in my studio. Right: Guitarist, Takeshi Akimoto examines his part on my arrangement of Midnight Sun, while sitting on the couch next to technology.